The torque of the gears is logically trasmitted on the bearings. If you have stronger spring, the torque is bigger and standard plastic bearings couldn`t survive so heavy load. This is reason why we offer metal bearings. Ball bearings icrease mainly rate of the fire and provide maximally smooth gear movement. It is recomended to use max. M130 spring. Material Carbon steel DIN100 Cr6. Application For 7mm gearboxes (Except No.6). Purpose For max.smooth gear move and higher ROF. 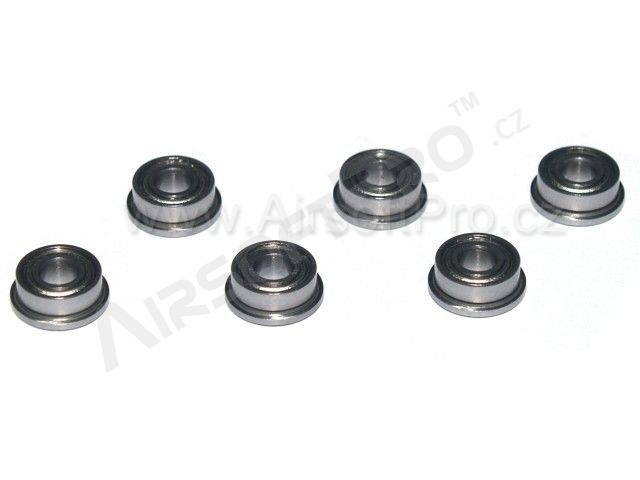 Qty per package 6 pcs of the bearings.